Last year I was invited to a co-worker’s wedding. And, since so many weddings nowadays involve being creative on a budget, they had a photo booth there that they set up themselves using Sparkbooth, a great little Adobe AIR-based application. 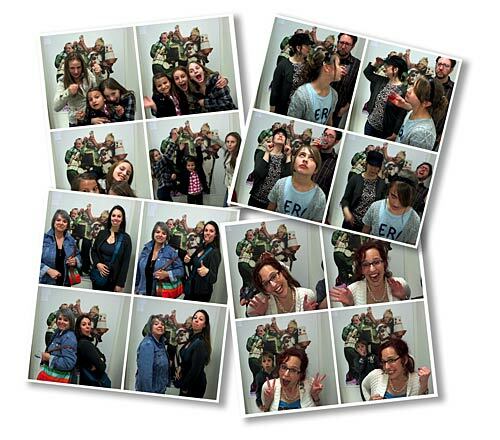 A few weeks later we were having our annual work party, and I was tasked with making a photo booth a reality. Since then I’ve been working on building a better photo booth experience. For the first one I set up, I used my MacBook Pro. We connected a Sony PD-150 video camera via FireWire and selected it in Sparkbooth rather than using the built-in iSight camera. (The iSight is a small camera, with a tiny lens, so the video camera ended up providing a better image.) We also put a little sticker on the space bar that said “PRESS HERE TO TAKE PHOTOS” and hoped for the best. It worked, but there were just too many moving parts to deal with, like the camera on a tripod behind the MacBook, and a light clamped onto the tripod. It wasn’t elegant. 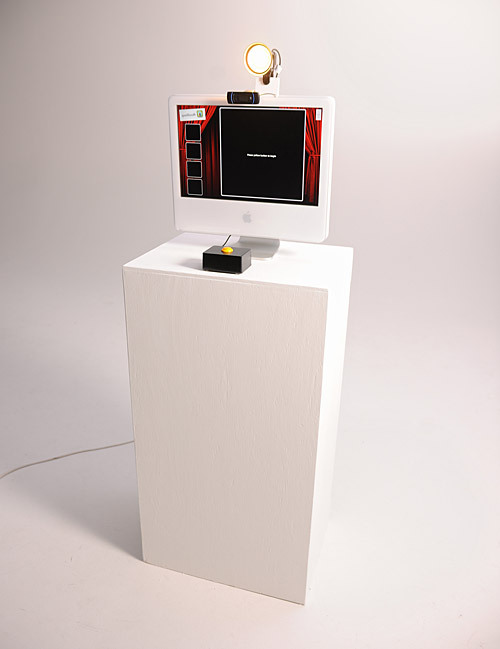 The Sparkbooth software is great and provides a ton of features, including the ability to upload photos to Flickr, Facebook, Tumblr, Posterous, or a dozen other sites. There are some optional features that would require a keyboard—if you prompt people to enter their name, email, a comment, or choose if they want the image uploaded or not—but the main interaction is through pressing the space bar to start the picture-taking process. If you need a space bar, you may need a keyboard… unless you build something that can emulate a space bar. When I saw The AWESOME Button on Make, I knew what I had to do. I had to build a button. 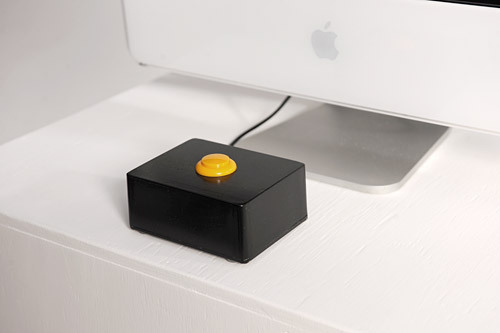 The button is simple, and built into a metal case. It should stand up to abuse that a normal keyboard might not, and it’s pretty simple. You can’t really press the wrong button, there’s only one. Ultimately I settled on using a Logitech HD Pro USB Webcam C910. Its image quality is much better than the iSight, and there’s just one cable to plug in. Just one problem… while it worked fine with my MacBook, no matter what I tried, I could not select it in Sparkbooth on the iMac. I tried everything, including different versions of Adobe AIR, different versions of Mac OS X, reformatting the drive, a clean install… nothing would work. I ended up disconnecting the built-in iSight thanks to some help from iFixIt. So I now had the button and the camera. I then needed something to hold it all together. I wanted a stand to put the iMac on that was about the right height for a “typical human being,” and by that I mean: about my height. (You can also easily adjust the camera by just tilting the iMac a bit.) I ended up building a simple pedestal out of plywood and painting it white. I used thin plywood to save on weight since it needs to be somewhat portable. You can’t see it in the photo but the back has been left open, and there’s an internal shelf for the keyboard and mouse. I keep those handy in case of trouble, or if I need to change any settings in the software. The shelf actually helps structurally as well. For the light, I used a small IKEA clamp light (you’d be amazed how hard it is to find a small, good-looking clamp light.) There’s an L-shaped piece of plywood behind the iMac that’s held onto the stand with a c-clamp. It works for now. I may upgrade the light in the future. I spent way more time than I should have trying to figure out why my Canon ZR800 wasn’t being seen by my Mac. I tested the Firewire cable, I rebooted, I re-installed QuickTime. The Sony PD150 worked fine, but the Canon was a no-show. Actually, there’s one HUGE caveat with that: the new Canon ZR’s 800-850 will NOT work with a Mac that has another FireWire device plugged into it. 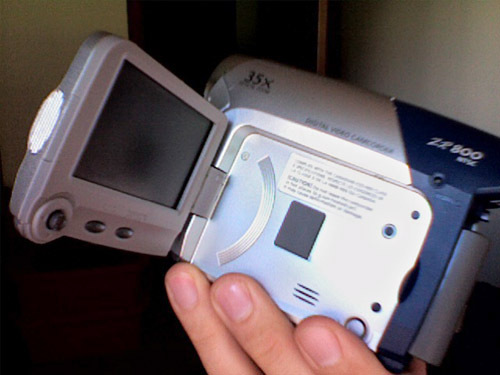 If you have an external hard drive, your iPod or anything plugged into one of the other FireWire ports on the computer and then you plug in a Canon ZR800 series camcorder and launch iMovie or FCP or FCE, it will crash and freeze the Mac OS. This is a huge bug I recently discovered when I bought a new Canon ZR-800 and ended up crashing all three of my Macs (I tried it on them all just to make sure). It does not mention the ZR800′s specifically, but trust me, it applies to them as well. If there’s nothing else plugged into the other FireWire ports, it works fine. The only trouble with that is that most people like to use an external firewire drive to put their digitized footage on. This is a big problem if that’s what you’re trying to do. Luckily I did not experience any real crashes, just the fact that iMovie and Final Cut sort of ‘stuck’ while the camera was turned on, and then resumed when turned off. The System Profiler also failed to show any Firewire device when the camera was on. Everything is fine when no other Firewire devices are connected, so there is a workaround… Still, it’s an annoying bug I hope can be fixed in the future.